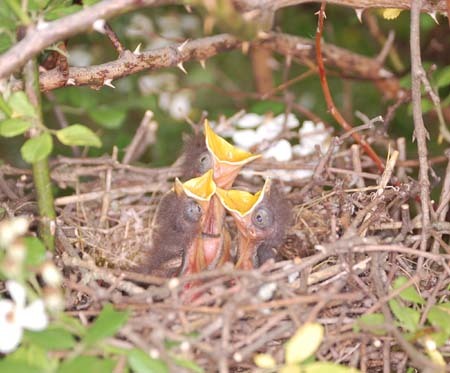 Mockingbirds often nest in a pyracantha bush in our front yard and always nest somewhere near the house, seeming not to mind the human inhabitants, except when we approach their nest. The greatest value of their willingness to nest close by is the nighttime serenading of the male, occasionally punctuated by the piercing screech of a barn owl. 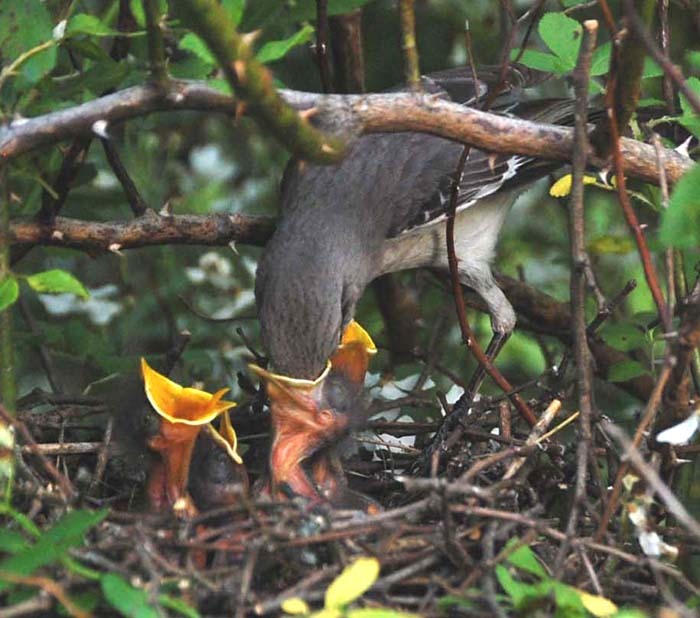 I will often awake in the middle of the night to the song of a mockingbird. And, occasionally, if there is enough moonlight, I will get dressed and take a walk, lured by the call of this nocturnal songster. These night walks offer some of the most memorable experiences of our home habitat. Sounds in the dark command our attention in the absence of visual distractions. The myriad sounds of the night seem intensified. They aren't - we are. We strain our eyes to make out dim and fleeting objects that would likely go unnoticed during the day. A splash in the creek, probably a bullfrog or a muskrat, stops us in our tracks, not to mention the sudden yelp of a red fox. And, always in the background is the steady chorus of frogs and crickets and the distant call of the great horned owl. But, it's the siren call of the mockingbird wafting through the open windows of summertime that lures me from my bed. The nest photos on this page are from a 2011 nesting along one of the trails. 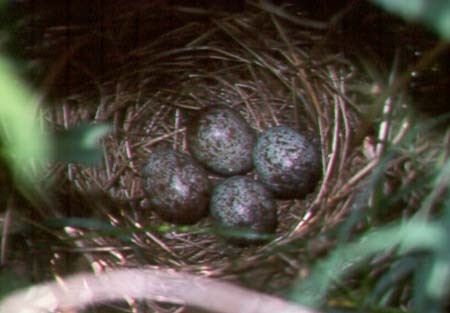 The trailer blind was left in position for several days and daily attempts were made to photograph the adults at the nest. 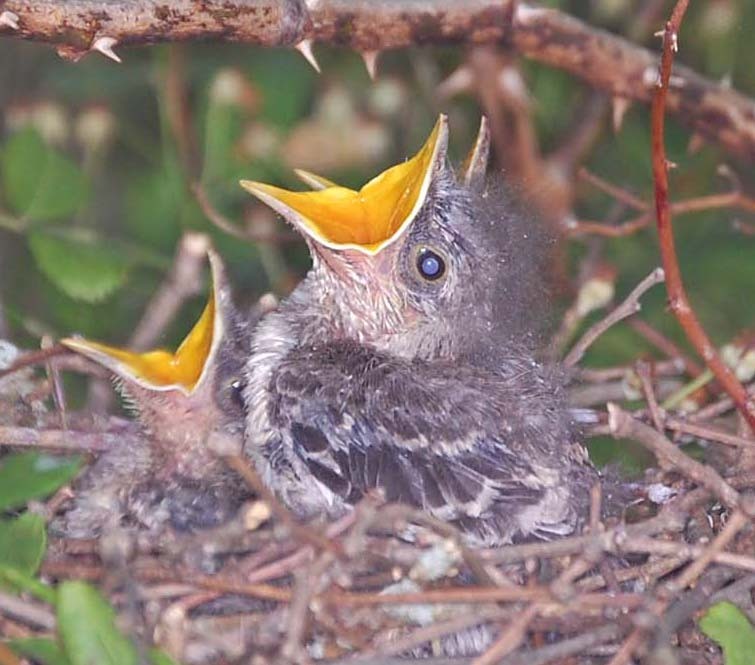 Surprisingly, the adults would not quickly return to the nest after I entered the blind. 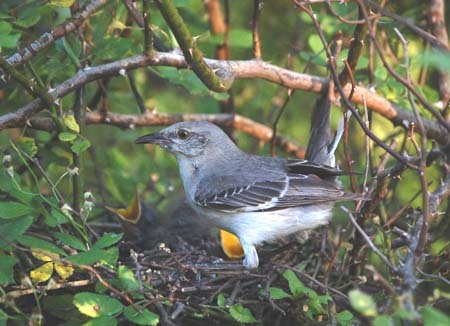 All other species I have observed from a blind would return very quickly to the nest after I disappeared into the blind. 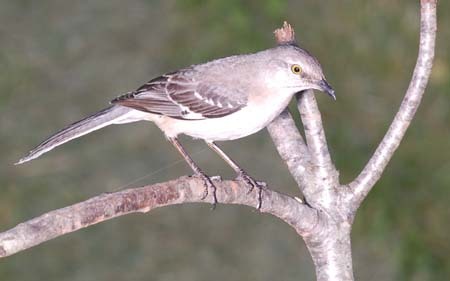 This included the mockingbird's closest relatives, the catbirds and brown thrashers. Not wanting to keep the adults away from the nest too long, I only out waited them out on two occasions to take several photos. They returned in about 15 minutes in both cases. When I entered the blind, both adults would focus their attention on the blind, watching nervously from various perches ranging from 10 to 50 feet away. 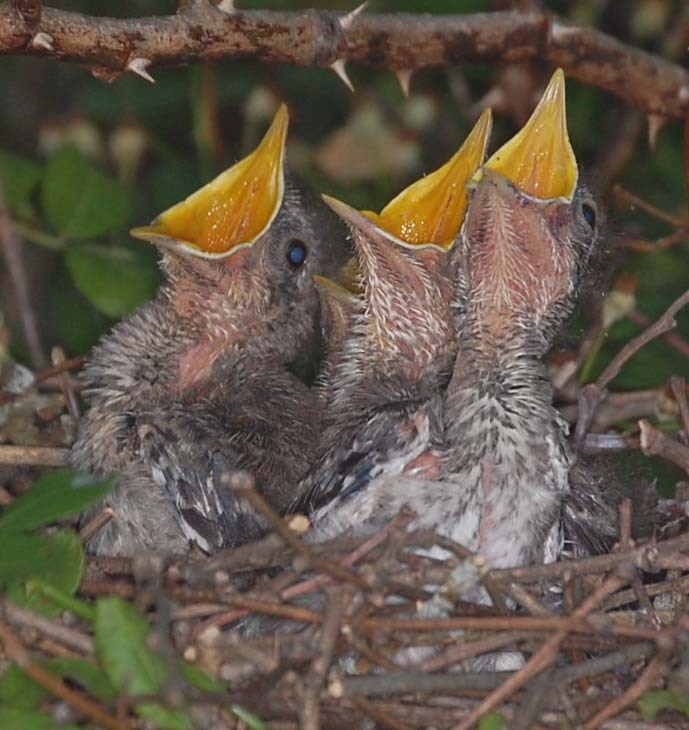 As soon as I reappeared and walked away, they would return to the nest. 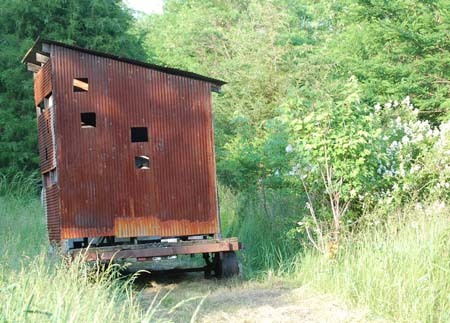 It would be interesting to use the old trick of having a second (decoy) person enter the blind with me and then leave. 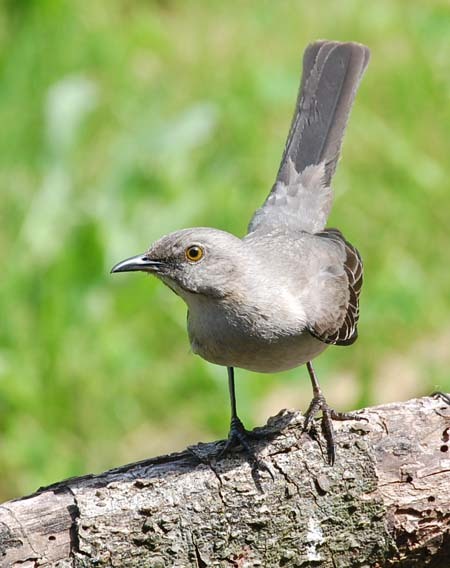 Given the mockingbird's ability to mimic other birds and even random sounds, and it's vast repertoire of it's own songs, it's no avian dummy. But, can it count?